A decade ago the Dragon Empire suffered a bitter defeat at the very edge of Nuria-Natal and routed into the Sands of Sorrows. There a young officer named Shard and his gnoll warband stumbled through a vicious sand storm and into a long-lost ruin. These ruins provided the small band shelter but also turned out to be the entrance to a well-guarded tomb, where they glimpsed treasure and strange magical writings that seemed to float throughout the tomb—and perhaps the secret to control or abjure the God-Kings of Nuria Natal! Great wealth awaits those who dare much. This is a classic-style Pathfinder Roleplaying Game adventure for 2nd level PCs near any desert or hills. This is a well written mod that can be easily adapted to a variety of settings. It's a good old-fashioned raid the tomb type of dungeon delve, yet it pulls a few surprises along the way (a certain muddy room is a nice touch). The best feature is a set of pre-gen Kobold characters to use; what player hasn't wanted to play in a party full of kobolds? This module is 17 pages long, 1 page front cover, 1 page editorial, 1 page advertisement and 2/3 of a page SRD, leaving us with 13 1/3 pages of content, so let's check this out! This being an adventure-review, the following will contain SPOILERS. Potential players may wish to jump to the conclusion. All right, still here? Set in the borderlands between the Dragon Empire and Nuria-Natal called Sands of Sorrow, the PCs are hired by a kobold herald to retrace the steps of a dragonkin - he hands a map that leads into the sands of sorrow to the PCs (provided as a beautiful handout, btw.!) to get him the magic he remembers from the tomb. After offering a selection of minor magic items to help in the endeavor, the PCs will set out into the sand of sorrows. The overland trek will include an encounter with some dust trappers and the tomb itself is guarded by gnoll zombies. (Including a map of the tomb's surroundings. )What's a problem here is that the encounters/sands of sorrows are not covered environment-wise - they remain abstract. We get no sample temperature, wandering monsters, unique hazards - lost chances. The tomb-exploration per se is interesting, including some creepy imagery, nice traps, a mud elemental etc. to make their way to the obsession-sparkling silvery script, which is the work of the module's boss, an allip-variant who is the final foe that stands between the PCs and interesting information on Nuria-Natal's secretive burial rites. It should be noted, that the map of the complex, while beautiful, does not come with a player-friendly version sans keys. Also, the Allip's statblock-header is in allcaps. However, it should be noted that the tomb, in contrast to the wilderness, gets some nice detrimental environmental conditions for your players to face. The module also includes 5 pre-gens, an all-out selection of kobold-characters. Editing and formatting are good, though not perfect - I noticed a couple of minor glitches. Layout adheres to a beautiful, two-column full-color standard and the b/w-cartography is beautiful as well, but the map of the dungeon lacks a player-friendly version. The pdf has full bookmarks, but no secondary printer-friendly version. This module was an interesting read to say the least - Mike Franke has created a conventional, short dungeon steeped in Midgard-lore, which is really neat! However, honestly - there's not that much going on in the module. The dungeon's nice, the fluff is nice and the module per se is not bad in any way. But neither does it truly feature a single brilliant idea, something that made me yell "eureka" and the pdf also has minor glitches. The lack of player-friendly maps also hurts this pdf. A couple of additional pages would perhaps have helped the module. Essentially, what I'm trying to say is that the fluff is the memorable thing about this module - it's good. But the rest, structure, locale etc. feel a bit generic to my tastes. Something distinct apart from the excellent Midgard fluff is simply lacking and coupled with the minor glitches and lack of player friendly maps make me settle for a final verdict of 3 stars, in spite of the great production values. I just finished reading through the module. I have not run this yet. I bought it to run at OwlCon 2013 with the Kobold Pregens. In my initial read through I found the layout fairly easy to follow. I liked the idea of having to deal with Dragonkin and Kobolds. If you run this with normal characters (What is a normal character? )the interaction with Dragonkind could get interesting. If the GM doesn't have a familiarity with the Midgard setting he will be a little lost to explain what an Akinji is. So there is that. However, a vivid imagination could overcome that small bump easily. I especially like the idea that this is designed to be run in a 4 hour time slot. Could be a nice change from a long running campaign for one session. The encounters are pretty easy to imagine and seem simple enough. As I said I have not run this so after I do, I might have a better idea of what to say. All in all why not give this one a try? You might find you like it. It's probably worth adding that the pregens and the fast-play style of this adventure are optimized for a 4-hour game. Good for conventions or a one-shot. I intend to run this at OwlCon 2013 as an introduction to both Pathfinder and the quality of Open Design. It is for 4 2nd level PC's. The Pregen's are Kobolds. Players at conventions seem to really enjoy the off-beat pregens, but of course the adventure is totally playable with regular PCs. 1 out of 1 people who wrote this adventure thought it was great. Seriously though, if you are looking for a night of good old fashioned tomb delving fun, this adventure is for you. I know I really enjoyed reading it! Ok might have to pick this up :) Once my current AP is done, it's gonna be a full blown Midgard campaign methinks ! This looks very cool, I look forward to a review by DM and/or EZG. Is it my imagination, were these products listed under "Open Design" and now it's called Kobold Press? Thanks Marc! Do you happen to have a link? "The changeover happened with Dark Roads & Golden Hells book, back in July. I got tired of hearing the two arms of the company called "Open Design/Kobold Quarterly", and I heard from a lot of retailers that they thought the company only did the magazine. The idea is to keep the Kobold theme and extend it to the sourcebooks, adventures, and PDFs, to make it clear that the Kobolds do more than the magazine. And the Kobold Press imprint will, hopefully, be easier for people to remember than the longer double name. Guess we'll see!" I heard about "Kobold Press" from Steve Russell... I was all "that sounds like Wolfgang Baur but I'm not sure... then I found out about the name change with the last "Sins" accesory. Kuddos for the new name, it does make thinks easier and still is very easy to relate to Kobold Quarterly/Open Design. I had a lot of fun coming up with the Kobold Squad as I think of them. Enough fun that I would love to write a new adventure specifically for them. Realistically though I'm not sure how many would survive the tomb to do more adventuring for the Dragon Empire. I dunno, kobolds are surprisingly resilient. Maybe another kobold squad adventure is called for? Is it me, or has the bend towards NOT overusing the "of the" in a title sometimes NOT make sense? Now I am not a grammar master, but I have been around a literary block or two. I know what sounds good (to me of course). 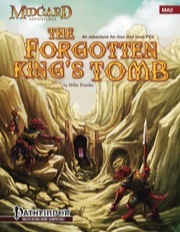 This title would be better if it WERE called "The Tomb of the Forgotten King." I know this sounds a bit tired, but that is mainly b/c of the use of the words "Tomb" and "King" - many titles have something similar - "Tomb..." this and "King..." that, so maybe THAT is where the effort should have been spent to be creative. This way the editor/writer would not have had to (my guess) purposefully say, "Let's avoid the 'of the' in this title by. . . ."
I think that's silly. 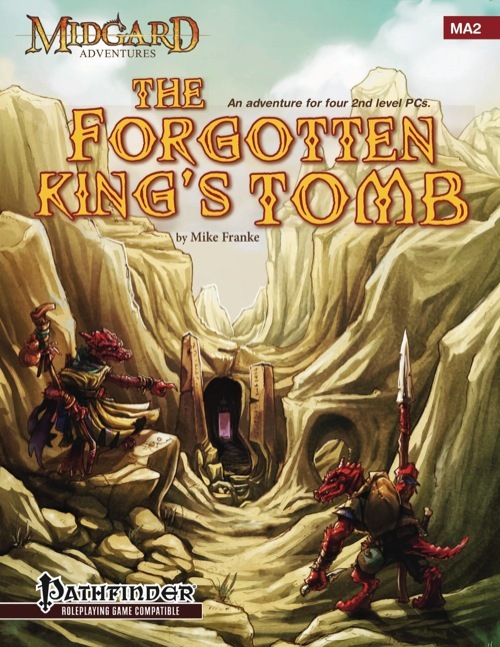 The focus of this adventure sounds like it is a TOMB, NOT the KING. Therefore the SUBJECT should be the TOMB and not the KING. And again, it just rolls more smoothly and sounds better as "The Tomb of the Forgotten King" than as "The Forgotten King's Tomb." You?? Besides, I think we need to watch our overuse of apostrophes in titles. The Misplaced Mausoleum of the Marvelous Monarch but in order to avoid the "of the" went with Forgotten King's Tomb. I suppose I could have gone with Marvelous Monarch's Misplaced Mausoleum! It would be cool to see a review of this from the folks that have it! Just posted a review. Sorry it is a little vague, but haven't run it yet. And reviewed here, on DTRPG and snet to GMS magazine. Cheers!